Where were you when you first saw Star Wars? I was a little girl, soon after the release of Return of the Jedi in 1983. It was this first viewing, when I was young and impressionable, where the entire world of sci-fi films opened up to me, and I began to develop a lifelong love of all things Star Wars! There are plenty of other Wrapunzelistas who feel the same and with the recent release of The Force Awakens, we’ve seen an influx of Star Wars-inspired tichels that are mind blowingly cool! Adina, Miri, Kathleen and Carie, sporting Princess Leia’s most iconic look! The creativity we see in tichel-tying is seemingly endless and many wrappers love to use this medium for expressing both their passions and hobbies. Star Wars, as illustrated here, is no exception! I mean, seriously, how cool is this look that Jessica came up with?! 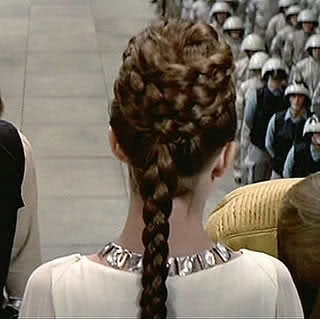 Naomi, a fangroup member, truly went above and beyond, experimenting with various techniques, before developing her own version of Princess Leia-like Cloud City braids. This one is just begging for a tutorial, am I right?! A beautiful princess. Absolutely incredible! Not all Star Wars wraps have been influenced by the film’s beloved female lead. Many women have gotten their inspiration from other characters, such as Chewbacca, Darth Vader and R2D2! Yasmine, Sam, Jana, Lila and another one of Sam’s, all looking excellent! What fun! While these wraps might not be everyday wear for most, they certainly are fun for a night out or even Purim! Would any of you believe that this here is Andrea?! ← Wrapunzel’s Best of 2015! wait…in ’83??! but Andrea, you look like 25! LOL. Thanks, Ireri, I’m totally flattered. Try tacking on about a decade to that number, though! Please, do an iconic leia tutorial before purim!!! We’ve got one in the works, Leia. It will definitely be up before Purim! Those are “powerfully” creative women. Lovin’it!!! Please do the Leia tutorial, Andrea! I can’t figure it out and I’d love to know how to do it! We’ve got one in the works, Alylonna. It will be definitely be up some time before Purim (mid-March)! 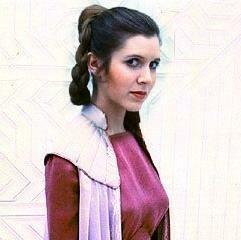 Is there a tutorial for the Double sided bun Leia wrap??? I can’t quite get it!